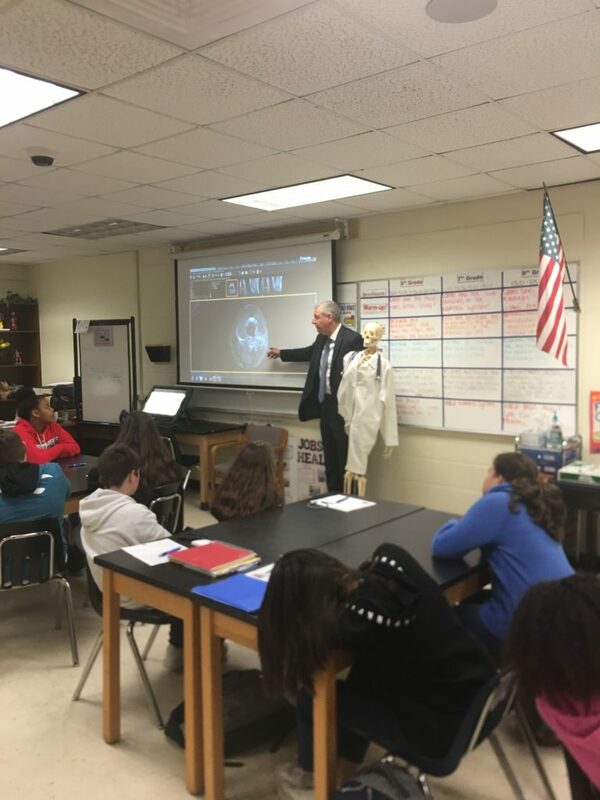 At the end of January, Attorney Jeff Gordon took time to speak with the sixth and seventh-grade students at Omni Middle School’s Medical Technology Academy in Boca. The Academy gives young students interested in medical professions the opportunity to build a foundation of knowledge in medical technology, anatomy, and basic medicine. This not only prepares students for more medical and science classes in high school, but it also helps them explore their skills and interests for their future. During his presentation, Jeff got to explain to the students that there can be lots of overlap between the medical and legal professions. They looked at how medical technology is useful for personal injury and medical malpractice lawyers. Jeff taught how lawyers must know how to look at MRI’s and X Rays to assist when helping a jury understand medical concepts. The students were incredibly curious and full of great questions like, “How does a lawyer prove that a doctor made a mistake in treating a patient?” and “How does a client get their medical bills paid?” The Academy is doing a wonderful job of shaping the minds of our future medical professionals, and we can’t wait to see how they continue to grow.